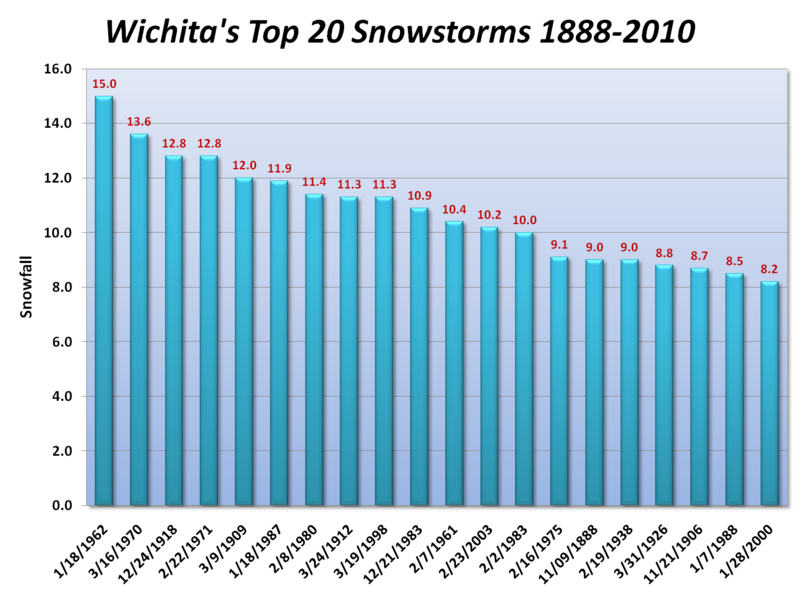 February 26, 9 AM CST Update: The Wichita daily record snowfall of 4.8" yesterday, plus 2" so far today, brings the monthly total to 21", which breaks the record. 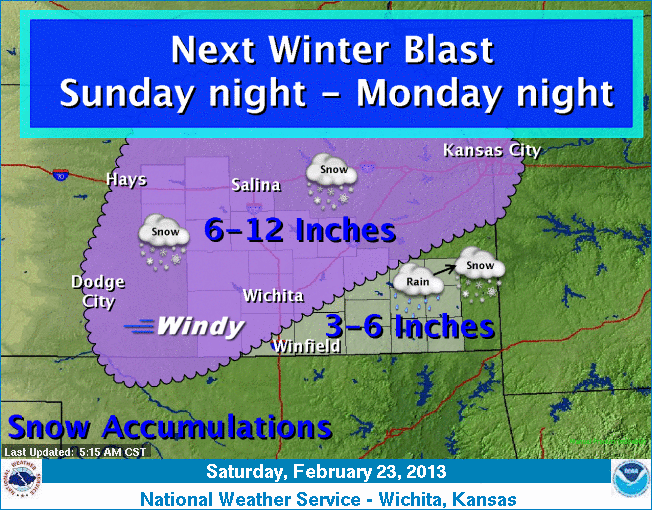 February 25, 8 PM CST Update: The heaviest snow appears to be passing south of Wichita. The National Weather Service reports just 1.9" so far today. It's still getting itself organized over the Rockies, but the next Midwest storm is threatening to bring heavy snow to Kansas for the second time within a week. 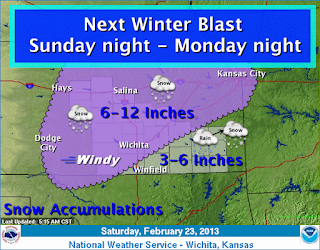 The current forecast is calling for 6-12" of new snow for Wichita. If this verifies even slightly above the low end of the range, it could push the current monthly total of 14.2" above the all-time monthly record of 20.5" set exactly 100 years ago. 8 PM CST Update: Unofficial reports of 12" or more of snow in Kansas have been added below. 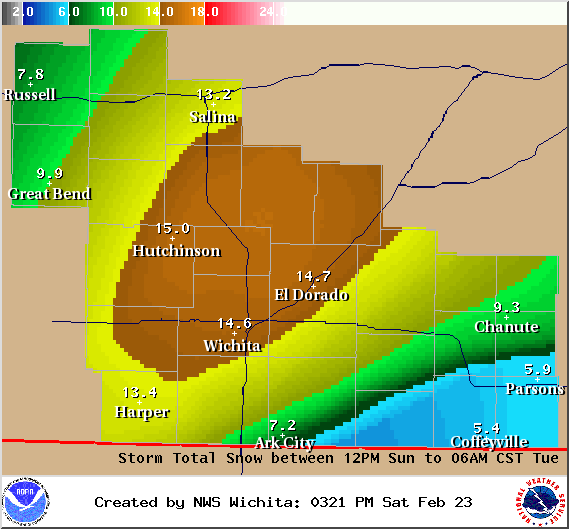 OFFICIAL STORM TOTAL SNOWFALL FOR WICHITA THROUGH 440 PM. MORNING WITH TOTAL OF 14 INCHES ON GROUND. 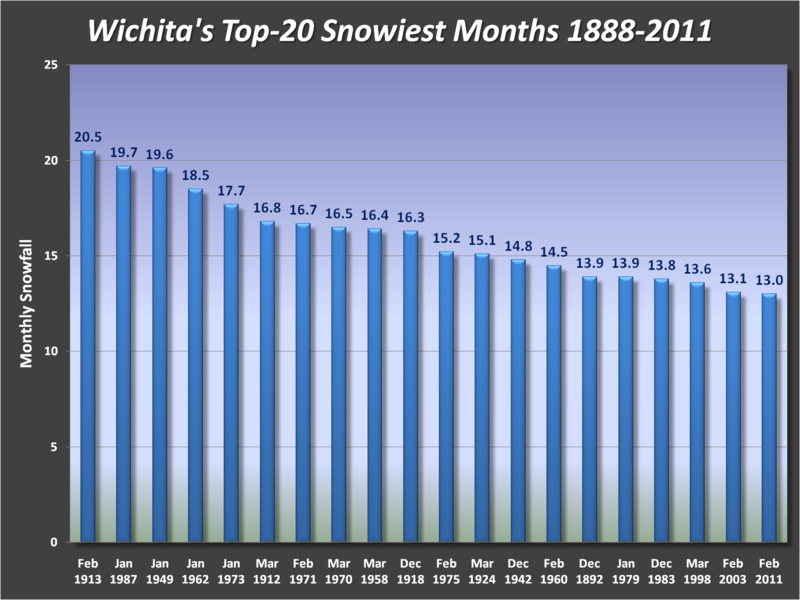 OFFICIAL STORM TOTAL SNOWFALL FOR WICHITA. INCHES IN THE HUTCHINSON AREA. DRIFTS OF UNSPECIFIED DEPTH ALSO REPORTED. 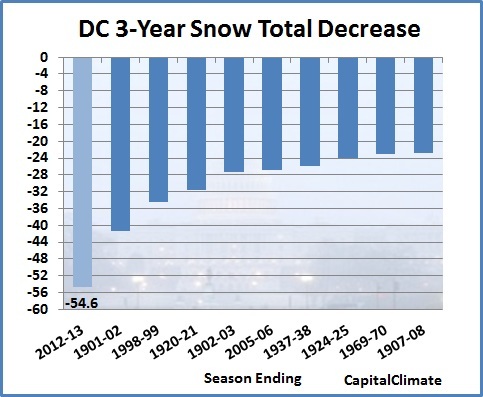 As the massive snowfalls of the 2009-1010 season fade into the rear-view mirror, Washington DC is close to ending meteorological winter with a near-record low 3-year snow total. With the latest nor'easter bombing out well offshore, there is no Presidents' Day snowfall this year, and model indications are that there will be little, if any, snow in the next 10 days. 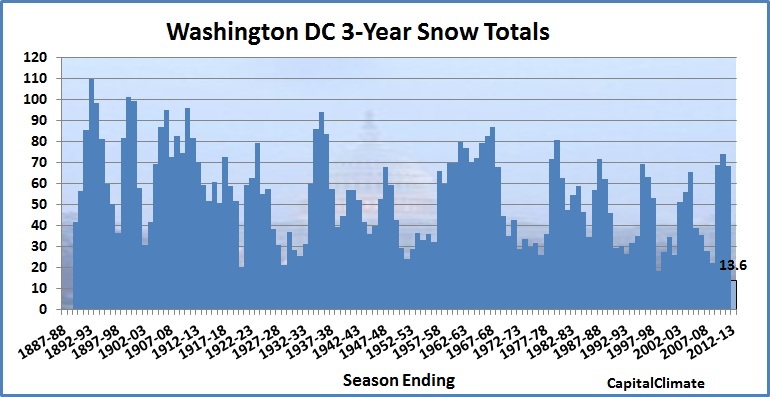 That would end meteorological winter with a puny 1.5", the lowest since the 0.1" in November 1997 through February 1998. For the past 3 years, the winter total of 13.4" is likely to be the second lowest on record, ahead of the 14.1" in the 3-year interval ending in 2008-09. 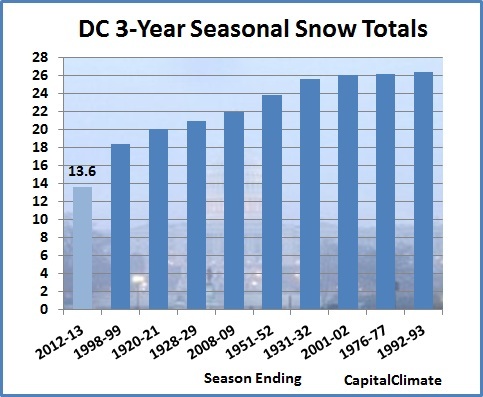 This means that two of the three lowest 3-year totals will be the periods immediately preceding and following the record season of 2009-2010. 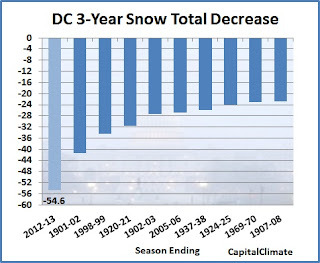 For the entire season (including all months), assuming no more snow in February, the highly erratic month of March would have to contribute nearly 5" for the 3-year seasonal total to exceed the current record low for the period ending in 1998-99. Comparing consecutive 3-year totals, the current amount of 13.6" is a massive 54.6" less than the 3-year total ending last year, which included the record high season. 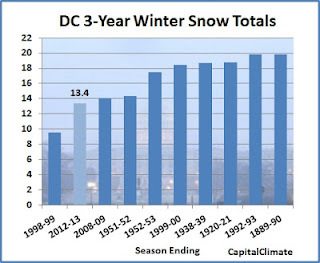 This is over 13" more than the 3-year decrease observed in 1901-02, the current record decrease.